The search for the missing five-year-old is ongoing as hope of finding her alive fades. AROUND A THOUSAND people have gathered at a special church service for missing Welsh five-year-old April Jones. The streets of Machynlleth in Powys were thronged with people making their way to St. Peter’s Church. April was last seen on Monday when she was seen getting into a vehicle while out playing with friends. The search for her continues as fears grow that she will not be found alive. Former lifeguard Mark Bridger was yesterday charged with her abduction and murder. He will appear in court in Aberystwyth. He’s a local man and is known to the Jones family. April’s parents were not in attendance at today’s service. Another service was also held at the local leisure centre for rescue workers. Email “Hundreds gather for church service for missing April Jones ”. 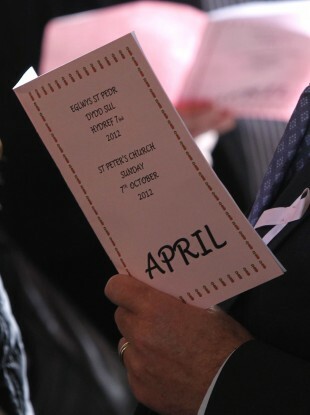 Feedback on “Hundreds gather for church service for missing April Jones ”.